Cook bacon in 10-inch skillet over medium heat 4 to 6 minutes, turning occasionally, until brown and crisp. Drain on paper towels. Add onions to same skillet with bacon drippings. Cook 2 to 3 minutes, stirring constantly, until tender; drain. Beat eggs, half-and-half, cheese, salt and nutmeg in medium bowl with wire whisk. Crumble bacon; add to egg mixture. Add onions and spinach; mix well. Divide mixture evenly among crust-­lined cups. Bake 20 to 25 minutes or until puffed and golden brown. Cool in pan on wire rack 10 minutes. Loosen and remove quiches from pan with tip of knife. Serve warm or cool. Store in refrigerator. 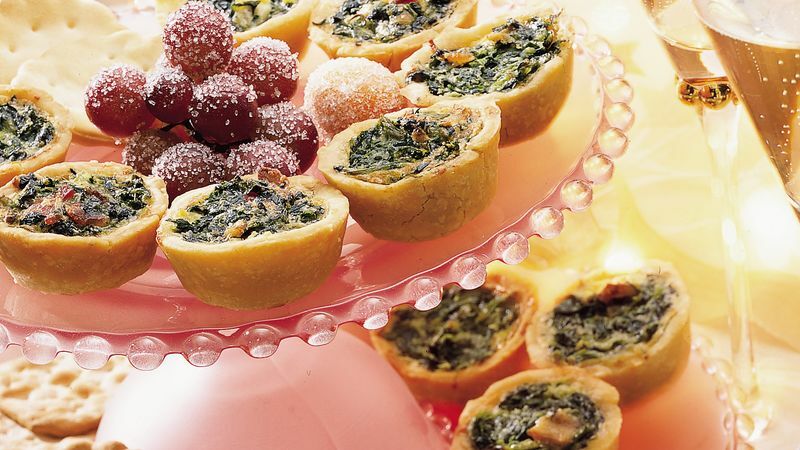 If using a 12-cup tartlet pan, bake one 12-cup batch at a time, using 1 crust at a time and refrigerating the remaining egg mixture until ready to use. You can cover and refrigerate the egg mixture up to 24 hours, so you can make half the recipe one day and the remaining half the next day.